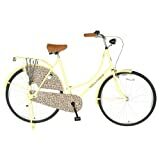 The Hollandia City Leopard is a city commuter bicycle for women. This bike is ideal for coasting along the paved town or city streets, campus rides or commuting within the city limits. It comes equipped with a hi-tensile steel frame which makes the bicycle strong as well as more durable. Although most of us think that steel frames always make a bike heavier, The Holliandia City Leopard shatters this notion. This bike is extremely light and as a result, handling the bike is quite easy. Front steel caliper and rear coaster brakes of this bike have ample braking force on offer and they operate with seamless ease. The bicycle comes with a fully enclosed chain guards and fenders which prevent water from getting into the parts and ensure durability. Alloy double walled rims of this bike coupled with its 28 x 1.75 inch tires are strong enough to efficiently handle the rough surfaces. The price point at which this bike is offered is unrivalled and if you are looking for a high-performance commuter bicycle, this can be your perfect companion. Release date April 1, 2011. Hi-Tensile Steel Frame which makes the bike strong. Hi-Tensile Steel Fork which offers just the right level of stiffness and ensures smooth quality. Front Caliper and Rear Coaster Brakes which offer more stability and control while braking. Alloy double walled rims which are strong enough to handle the rough surfaces. Fenders and fully enclosed chain guards which prevent water from getting into the parts. 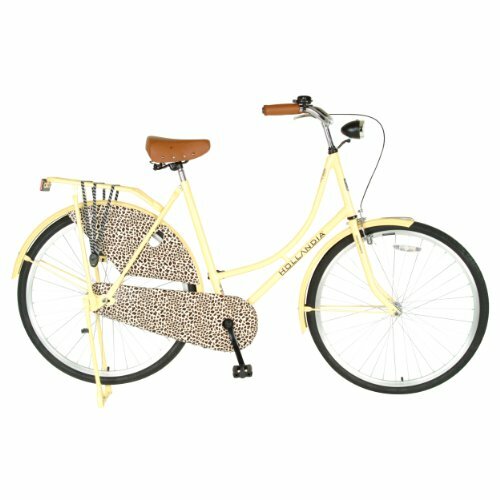 The Hollandia City Leopard is an ideal bike for commuting within the city limits. This bike comes with a steel frame, a fully enclosed chain guard and fenders which protect the components of this bike from damage caused by water contact. The ride quality offered by the bicycle is pretty smooth and enjoyable. The brakes of this bike work well and offer ample braking power to stop the bike in time. Now to the downsides of the bicycle: it makes a lot of squeaking noise which can be extremely annoying. The seat and the pedals are quite cheap and low end. The tires also are pretty thin and wear out pretty quickly. If you are looking forward to a hassle-free ride experience, changing the tires is a must. You might also think of having the saddle upgraded for a more comfortable ride. Overall, the bike looks good in terms of performance and price. The ride quality offered is quite satisfactory and the price point at which this bike is being offered seems quite reasonable. This bicycle is a bit on the bulkier side and if you have small body stature, it might be a bit uncomfortable to handle the bike. This is a factor that you should keep in mind while buying the bike especially if you are on the smaller side.